Earlier this year, Dodge Ram began offering the 1500 EcoDiesel, which became the first light-duty diesel pickup in the United States in more than ten years. Even more impressive, at an advertised 28 miles per gallon on the highway, the 1500 EcoDiesel has the highest EPA rating of all-time for a full-sized pickup!!! But according to some reports, 28 miles per gallon may even be a conservative estimate. Autoblog’s Sebastian Blanco reported after an official 1,000 mile long test that the truck was getting 35.7 miles per gallon. Adding to the fountain of riches is the fact that the increase in gas mileage has not affected the 3.0-liter V6 truck’s performance. So far this year, these factors have helped the new Ram truck kill in the sales department, even helping Ram increase total sales by nearly 20% since 2013. This, of course, was a much needed boost for a company that has been struggling ever since being devoured by Fiat. 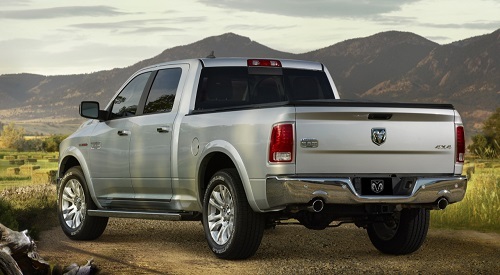 The temporary resurgence with the new 1500 EcoDiesel, however, isn’t enough for Ram. They want to continue progressing and putting out trucks that operate at the highest level. In his interview with Automotive News, Hegbloom even hinted that the company has its eye on an official 30 mile per gallon tag in the near future, saying that whatever manufacturer can hit that mark will “win” the pickup battle. That would be a win that Ram desperately needs to keep their current momentum going forward. This entry was posted in Culture and tagged 28 mpg, 30 mpg, Bob Hegbloom, ecodiesel 1500, ram. Bookmark the permalink.